Photo of the day: As part of the new TSA pilot program, Bob gets a sticker for his bag each time he passes security screening without a bag check. Next post: Chapter 11 – Dating pilots: why I want to say no when the answer is yes, yes, yes! As part of the new TSA pilot program, Bob gets a sticker for his bag each time he passes security screening without a bag check. This is my baggage. There are many like it, but this one is mine. My baggage is my best friend. It is my life. I must master it as I must master my life. My baggage, without me, is useless. Without my baggage, I am useless. I’m not sure why I like this one, but I do! MIA – A status this bag will never be. ??? Wait…… This isn’t Puppet-Con! A PASSANGER HAS M.I.A WITH A BAG OF FRUIT, PLEASE DO NOT LET THIS MAN THROUGH HE COULD A THREAT TO THE FOOD ECONOMY! A PASSANGER HAS GONE M.I.A WITH A BAG OF FRUIT, PLEASE DO NOT LET THIS MAN THROUGH HE COULD A THREAT TO THE FOOD ECONOMY! Are those bird stickers? Very strange. 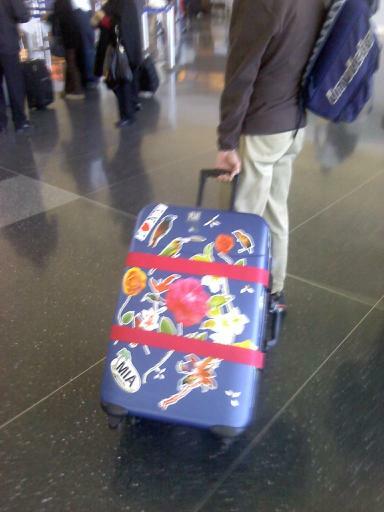 Note to self: Do not let your grandkids near your new luggage with sheets and sheets of stickers. Oh, ehh, this isn’t mine…. It’s my daughters…. This bag better fly free! Excited to be bringing home his 43rd pink flamingo to complete his lawn decorating.